Outlander reintroduces an old friend while continuing to explore the tension between the settlers of North Carolina, those who claim to own the land and the indigenous population. I talked at length about the problematic nature of Claire and Jamie’s characterisation in “Do No Harm” during that review and this episode suggests it’s going to be a problem that clings to them over the course of the season. It isn’t entirely that they are being badly written -though that is part of it- as it has more to do with how the writers perceive them relative to other cultures. In the case of “Do No Harm” they were cast too far in the “White Saviour” light which is impossible to pull off no matter how you choose to tackle it and this episode continues the trend of largely developing the culture of the Cherokee only as an extension of Claire and Jamie’s role in the show. A clear example of this is Claire acting as the mediator in the conflict between the German settlers and the Cherokee looking to give their horses the water they need from the creek that was once theirs without challenge. It takes Claire to suggest the common sense approach of moving to another part of the creek to avoid unnecessary bloodshed rather than both parties arriving at a compromise on their own. I get that the show is building towards an open conflict between “invader” and “native” that will have the main characters in the middle of it but this is far from the most sophisticated way to do it. A better way would be to focus on the Cherokee and have the solution come from their cultural identity. Their decision to move to another part of the creek is a great opportunity to showcase their reaction to yet another instance of them standing down to a technologically superior foe just to keep the peace and prevent their people from being unnecessarily slaughtered. Instead they come across as stubborn with Claire being needed to save their lives. This is far from a bad scene; it creates the right level of tension for something like this and it feels like Claire is in genuine danger from both sides of the conflict as she has put herself in the middle to avoid any bloodshed. She does represent that middle ground as she has gained some understanding of the Cherokee culture while also having knowledge of the tendency to fear what isn’t understood. This means that the German settler are acting out of fear rather than hatred which exemplifies the larger issue of untrue stories being told of the savages who brutally attack those the see as invaders on their land. Last week showed Claire, Jamie and audiences how peaceful the Cherokee were to those who treated them with respect but this is a lesson that won’t be learned by many which ends up causing a lot of the conflict. A clear example of a lack of understanding leading to fear is the blessing that is performed on the stream before the Cherokee leave. It is assumed that the water has been poisoned which is unfortunately confirmed in the minds of the settlers once their newborn baby dies. It’s easy for an ignorant mind to draw the link between the blessing and the death which leads to leaping to conclusions. Claire is also implicated as being responsible as she was the one who brokered the truce that led to the infant death. It increases the stakes but only along the lines of how it relates to Claire which is understandable in the context of a TV show where she is one of the leads but also feels like a missed opportunity in terms of developing the Cherokee way of life. At this point there are very few speaking roles as they only fill out the background of a Claire centric narrative that is less about them and more about how she sees them. Once again, it’s her story but stepping away from that now and again is healthy especially when it builds the world around her to show how it functions without her in it. Even though it was a Claire centric scene, the show needs more moments like the one shared with Adawehi. It’s a fairly simple interaction where Claire learns a handful of Cherokee words and phrases but there’s so much weight behind it as it shows a willingness to learn on Claire’s part as well as a keen open minded interest in those around her. Teaching each other how to understand what is being said is symbolic of building a bond between people who seem very different on the surface but have many similarities when proper effort is made. This also foreshadows Brianna’s journey into the past when the conversation comes onto children. 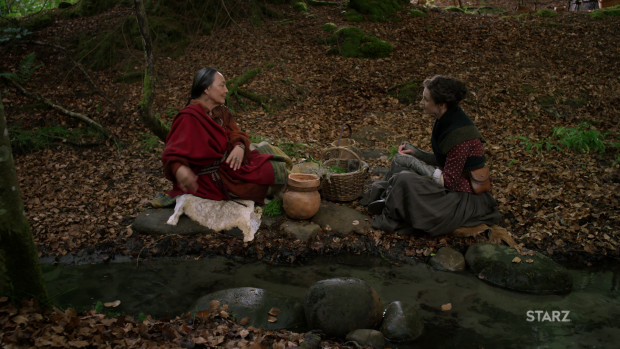 Adawehi tells Claire that her daughter is “here” which Claire takes figuratively assuming that Adawehi means that Brianna is always with her in her heart though elsewhere in the episode it is confirmed that her arrival into this timeline is imminent which strongly suggests that Adawehi has some kind of heightened awareness of these sorts of things. My prediction that she is a descendant of the man Claire saw in her vision continues to hold weight. Killing Adawehi was a huge mistake and not because killing characters is always a bad thing. When used effectively -as this show has done repeatedly- the death of a character can be meaningful, moving and important when it comes to upping the stakes. Adawehi’s death felt empty because it only existed for shock value and to spur a change in Claire that informs her actions afterwards. It Adawehi feel more like a function of the plot rather than being a fleshed out character in her own right. The bond developed between her and Claire was heartfelt and interesting as they are two women united by their skills as healers but building this up only for Claire to grieve by the end of the episode comes across as cheap and manipulative. It’s a waste of what was already a great connection that could have been so much more than was seen. On a broader level it represents the racism of the time and the hostility that comes with it which makes the situation worse as it further cements Adawehi as a personification of concepts rather than the fully realised character that she could have so easily become. Outlander doesn’t seem to know what point it’s trying to make about history so continues to misrepresent large issues by focusing on Claire’s limited perspective. Jamie is dealing with his own problems settling Fraser’s Ridge. The biggest issue he has at this point is finding tenants despite his overly generous proposal to let them live rent free until they turn a profit then charging very low rent thereafter. To his surprise nobody wants to accept his offer despite the fact they will never find a better deal anywhere else. A little bit of digging reveals that the potential tenants don’t trust the offer because it is well known that similar offers have been less than genuine and that people have had their land seized due to an inability to pay a rapidly inflating tax. Of course we as viewers know that Jamie is a lot more honourable than that and can be taken at his word but hit potential tenants don’t so it’s understandable that they are unwilling to take that risk. Dialogue with Ian fleshes out Jamie’s intention to only pay a fair tax to those he owes it too which will most likely not be quite as easy as he makes it seem. The misfortune of a “broken bit” reunites Jamie with Murtagh; an old friend he thought was long dead. Amusingly his appearance is a lot older than when he was last seen which serves as a reminder that a great deal of time has actually passed despite how young Claire and Jamie still look. At first it’s a very dramatic reunion but quickly settles into the familiarity that would be expected of a relationship so well developed earlier in the show’s run. This technically makes for another really unlikely coincidence considering how many years have passed and how far everyone has travelled only to end up in the same place at the same time. I’ve mentioned that Claire and Jamie being separated by circumstances has become a trope; it could be argued that running into old friends or acquaintances in the most unlikely of places numbers among the tropes associated with this show. 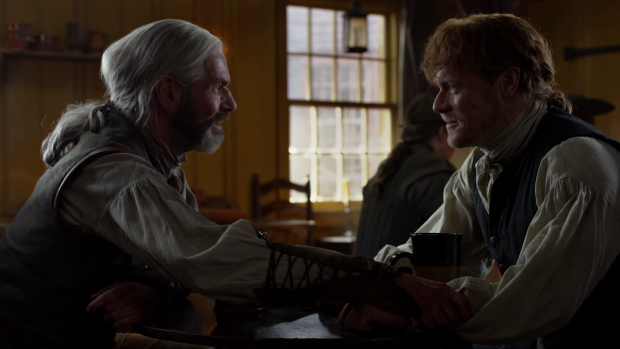 Despite this, Murtagh is a welcome addition to the cast at this point and the scenes he shares with Jamie are great. They clearly have the sort of connection that is easy to pick up even after decades of no contact and there’s a lot a comfortable familiarity to the relationship that comes across. 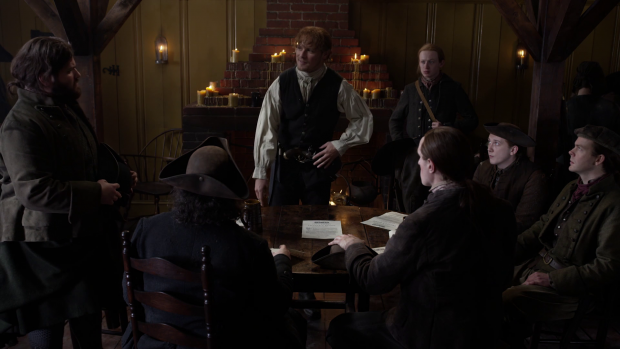 On a plot level, Murtagh gives Jamie an in with the settlers as he can make a case for how trustworthy Jamie is. At first he’s reluctant because he thinks the position he’s in is sufficiently safe for him at this point though he has no love for the establishment as shown by encouraging the people to spend their money instead of giving it to the tax collector. Such seditious behaviour is bound to attract some unwanted attention which will add to the overall tension that contributes to the American Revolution. One thing the writers are doing well this season is establishing that there are many contributors to the American Revolution. Large scale historical events such as that have a number of causes so it’s right to deliver different examples even if they are from limited perspectives. Ultimately the show keeps this focused on the people involved so when it is eventually covered it will most likely act as a microcosm of the larger conflict with the scope of it only hinted at. I would prefer this approach as it’s so easy to be lost in the enormity of the situation and not focus on those that the audience cares about. An uneven episode that once again fails to address the complexity of an issue through focusing too heavily on how it relates to Claire and Jamie. The German settlers fearing the Cherokee who come to their part of the stream so that their horses can have much needed water makes sense given the rumours flying around about what the “savages” do to those that stake a claim in their land but it’s only a small part of a much larger issue. Claire trying to broker a truce both works and doesn’t. It works in the respect that she has come to understand the Cherokee to some degree while also understanding why people would fear them but fails in that the Cherokee fade into the background, only characterised by Claire’s perspective of them. This mistake repeats with the death of Adawehi who feels more like a function of the plot rather than the fully realised character that she could so easily be. The scene showing her and Claire bonding over being healers is great but feels manipulative in retrospect when she becomes the personification of fear and racism with her death only existing to prove a point. Jamie struggling to convince people to settle on his land works really well because it introduces a problem that will only get worse. His generous offer is declined because the people have a reason to be suspicious after all the stories of land being seized following unfair tax hikes. On a plot level reuniting with Murtagh gives Jamie an in with the people through a voice that they trust while also rekindling a friendship with someone he thought to be long dead. It’s great watching them interact once again and amusingly Murtagh’s appearance serves as a reminder of how much time is supposed to have passed since they last saw each other. It’s easy to forget when considering that Claire and Jamie barely age. This sets up an escalating situation with the experiences of the characters serving as a microcosm of the larger issue. Interesting review. The empty feeling you expressed for Adawehi’s death is an unfortunate side effect of the limited time in the show for the volume of book to cover. However, I will point out that Adawehi predicted her own demise in the previous episode. “Death comes from the God’s” refers to the measles and the statement “It won’t be your fault” refers to Claire’s not being at fault in Adawehi’s death. Before reading Drums of Autumn, I did not know anything about the Regulators. Making Murtaugh (who died at Culloden in the books) a Regulator will put him at odds with Jamie down the road. If you look up historical facts about Tryon and the Regulator Movement you will gain some insight.